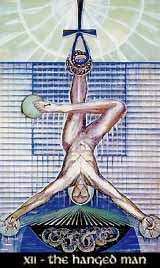 The Hanged Man is a symbol for the turning points in life, showing up a need to stop and assess a situation. We're hanging in the air until we find a new view of the things around us, a proper way to rearrange or restart. But the Hanged Man is a 'silent' card - there's no pressing need for change. No big change is waltzing towards us - we can peacefully keep on hanging and complaining. The Hanged Man just shows that we're just 'hanging', he requires a new viewpoint, and sometimes a lot of patience. In its positive aspect, the card shows the need for a time of consideration, the forced relaxation gives the opportunity to relax and reflect, to sort thoughts and ideas and find a new way to cope with a situation.